For any followers I may have that are reading this, you may have noticed that I've fallen short of keeping my webspaces updated. For good reason! On top of my regular winter activities (snowboarding primarily), I've been planning a massive multi-week road trip of the Southern Rocky Mountains throughout the United States! Including stops at "grand" locations, like "Grand Prismatic Spring", "Grand Teton National Park" and "the Grand Canyon" just to name a few. Read on for more details and images of proposed destinations! The trip will begin with a party at the Ski Hill in Lake Louise, Alberta. It was home to me for several years of my life, and I will not pass up any opportunity to return especially during some of my favourite times of the year. From there, we will continue East towards Calgary, and then make our way south to Waterton/Glacier National Peace Park bordering Alberta Canada and Montana, United States. I visited the two parks before in July 2008 and was so astounded with the scenery that I'd be happy to have a second chance at capturing it, this time in a very different season. 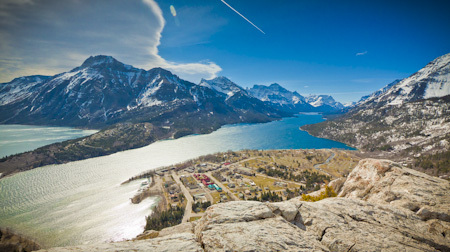 Everything past Waterton becomes foreign to me. I will be including Flickr images from other photographers, of some destinations I am most excited to visit and shoot for myself. Please inspect the caption of each image for the photo credit and hyperlink. Our first stop in the United States of America will be Helena, Montana. Maybe not a primary destination for a grand tour, but it has a park, a body of water, and is en route to our next main destination - Yellowstone. Over the course of our trip, we intend to make a few more stops than may seem necessary to keep driving to a minimum and only in the daylight hours. We will be camping for a greater portion of the journey and setting camp at night is not my favourite activity. Among the attractions of Yellowstone, Grand Prismatic Spring is one that I can remember seeing photos of since a young age. Excited to taste it's colours with my eyes, and in some way transliterate the few short moments I have into a series of lasting images. Yellowstone is also home to Old Faithful - I first remember learning of this one as a young lad in a particular Bugs Bunny cartoon involving the guy with the big red moustache, which I think may be more realistic than it's recent portrayal in the film "2012" where the world opens up and nearly swallows John Cusack. knock on wood. The Yellowstone Caldera, after all, North America's largest volcanic system and has been dubbed a "Supervolcano". Yellowstone provides our gateway to the next park, Grand Teton. One of the more recent beauties I've learned about in the United States, mainly from ski and snowboard films I've watched in the past. I can only speculate, but I like to think the weather will be similar to that which I was accustomed to in Lake Louise in the same time of year. "Salt Lake City" by Andy:-) on Flickr. 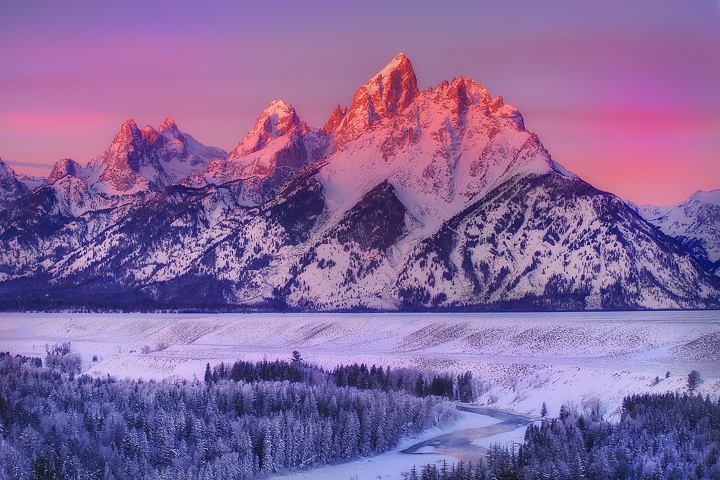 From Grand Teton, we will leave Wyoming and make a brief jaunt through Idaho towards Salt Lake City, Utah. Site of the 2002 Olympic Winter Games. We will find somewhere close to stay, although like Helena, cities are not our primary targets. After all, it's raw wilderness adventures we seek with all five senses. 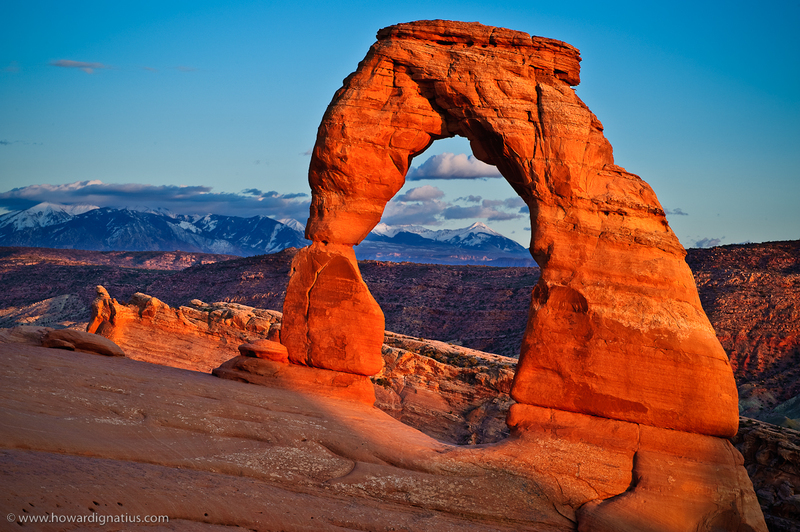 Coming up will be one of my main draws for this trip - Arches National Park. Just google a couple images, and it will say more than I can with all the paragraphs I've used already. I haven't had many chances to see any sort of 'red rock' and then add these spectacular formations to the mix and a blue sky to contrast for a match made in heaven. Needless to say, we've accounted for a few days in the area. 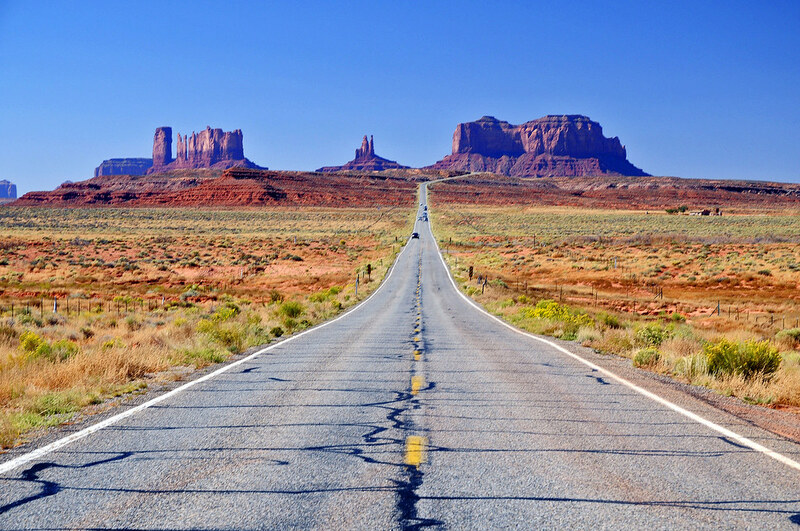 Monument Valley will be a scenic drive and serve as our entry point to Arizona. We will continue along the north end to Page, Arizona. 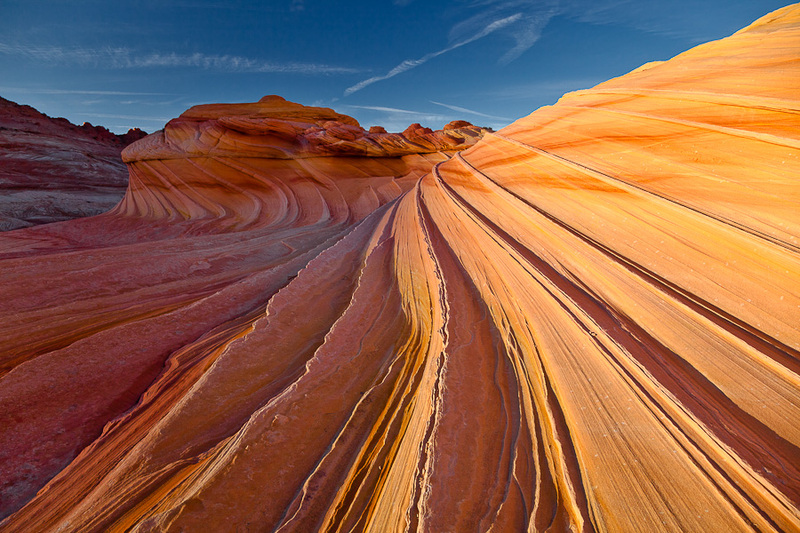 Home of Antelope Canyon which is home to one of the most picturesque locations in North America. The area recently appeared in the film "127 hours". "Antelope Canyon" by chrigl80 on Flickr. Also in the immediate vicinity are the Vermillion Cliffs, Bryce Canyon, Lake Powell and back in Utah - Zion National Park. All of which are destinations. All of which are worth googling. When you view these on a map, you'll notice how close in proximity they all are to each other. After we are done in that little section, we will be continuing to the Grand Canyon's northern end. 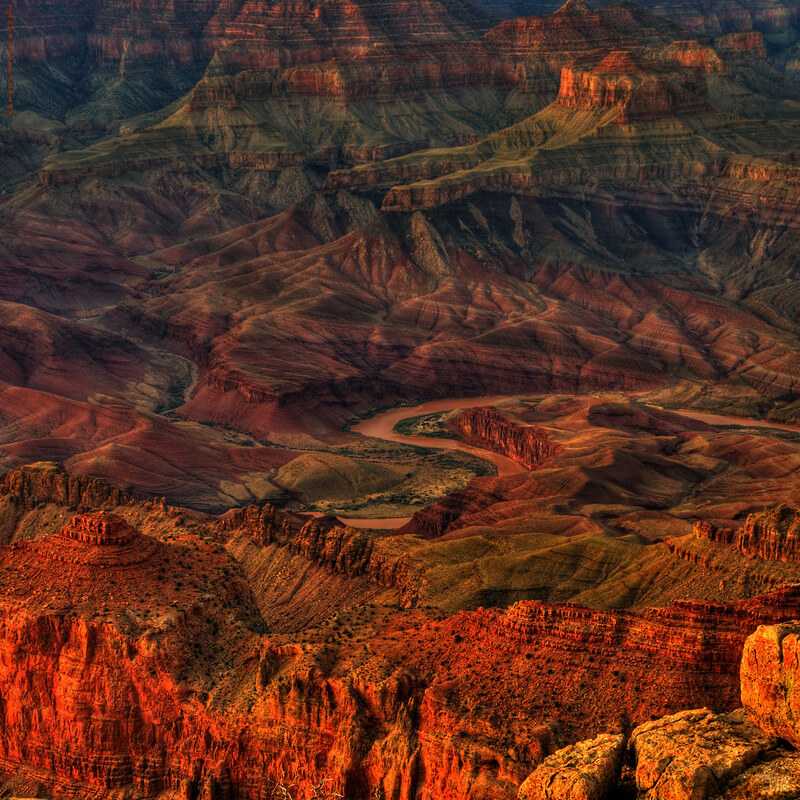 From the Grand Canyon, we will continue south to Tucson where we will rendezvous with some family at their time-share. A chance to recharge the batteries (literal and metaphoric), sleep in a bed again, and check out the Sonora Desert which may or may not still be in Cacti Blooming season. The detailed plans have reached as far as Tucson. Although we are mostly aware of the destinations and routes for the northbound return, much of it remains unplanned. 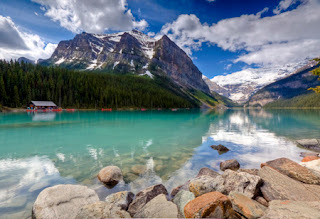 Already in the duration of our trip south, we will start in nearly full winter conditions in Lake Louise, and by the time we are at our southernmost point, we will likely be in sweltering desert heat putting the hottest I've experienced in Kelowna to shame no doubt. 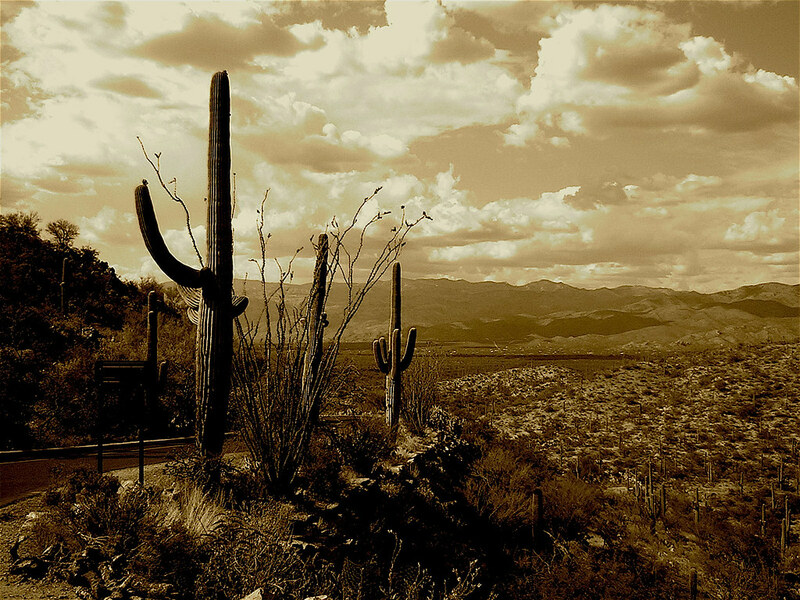 "Desert/Mountain View in Sepia" by omphale44 on Flickr. I will share the northbound return plans in a future, "part two post". As for the photos in this post, I can only hope to capture the scenes half as well as the photographers of these photos have, and look forward to begin sharing my results sometime in June!